Posted on December 23, 2015 by Barry V.
Moose Hill Wildlife Sanctuary in Sharon, is Mass Audubon’s first and oldest sanctuary – established by the Society in 1916 (The staff is looking ahead to the 100th anniversary next year!). It’s a large, rambling property of nearly 2,000 acres with more than 25 miles of trails. Moose Hill is also in a densely populated area of the state, and is well-loved and heavily utilized by the surrounding communities. 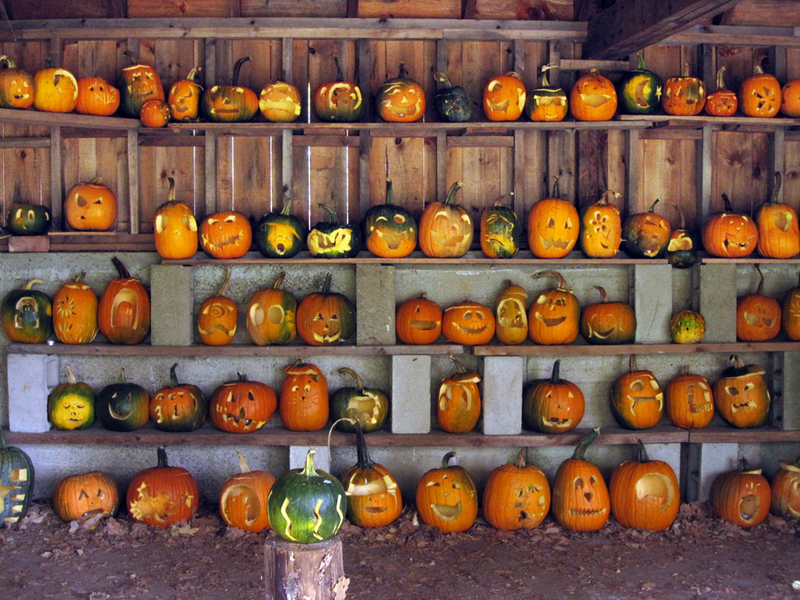 Just the previous evening, a big pumpkin carving event had attracted hundreds of families and children, and their work was on display around the sanctuary. It is raining steadily when I arrive at 9 am, but the forecast promises that the rains will be ending by 10. 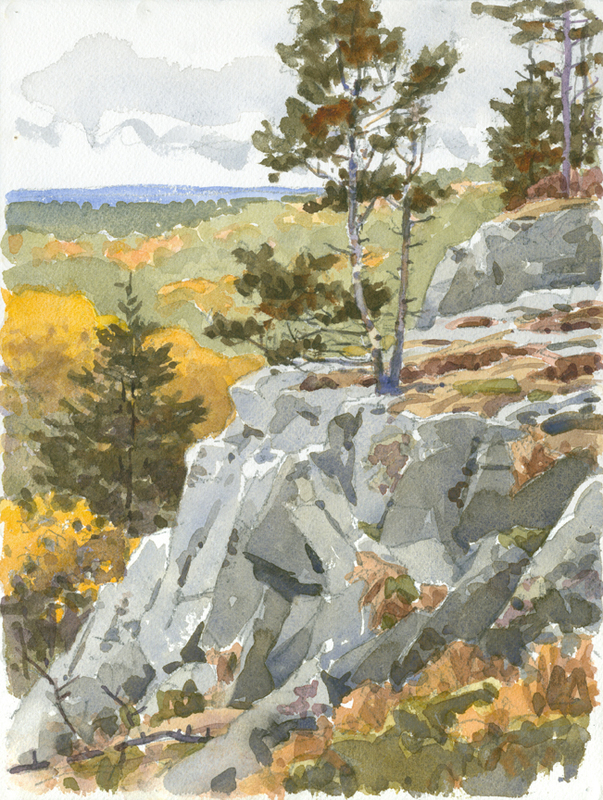 Without lugging along my paints, I take an exploratory walk while the weather improves. I hike the Billings Loop Trail, check out the pumpkin carving display in the “bat house” next to the Billings Barn, and stroll the boardwalk through the red maple swamp. By 11 am, it looks like the skies are clearing, so I pack up my field kit and lunch and head up the Bluff Trial. 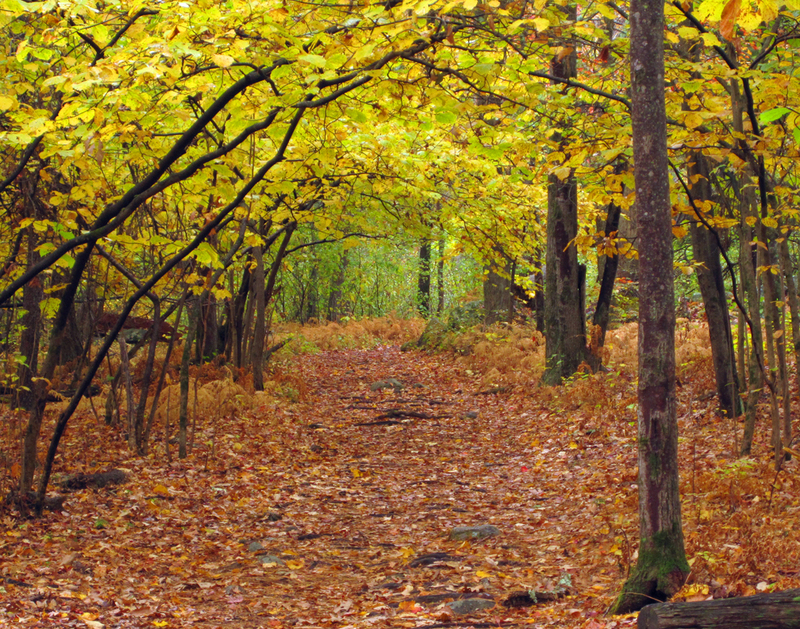 One lower section of the trail leads through a “tunnel” of arching witch-hazel turned bright yellow – a novel effect. 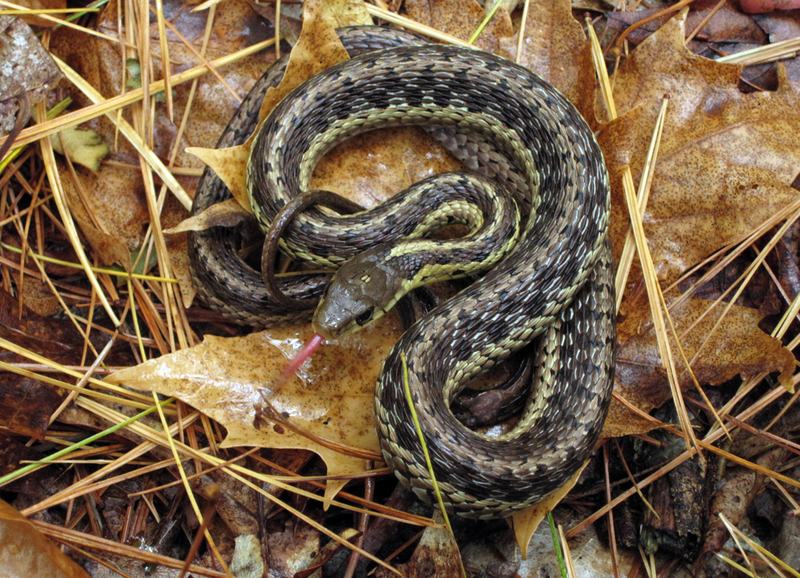 As I near the Bluff Overlook a small garter snake slithers across my path. I step into the woods to cut off its retreat, and then gently touched its tail. It immediately coils tightly into a defensive posture – a sign that I should leave it in peace! The rocky ridgetop of the Bluff Overlook (elevation 491 ft.) hosts a plant community quite distinct from the surrounding forests. Eastern red cedars are the most conspicuous feature, but there’s also a predominance of pignut hickory, and a small shrub-like oak called Bear Oak. Clinging to the rocks on this exposed ridge, the cedars have a craggy, weather-beaten look, with parts of their trunks and roots polished to a silvery white. 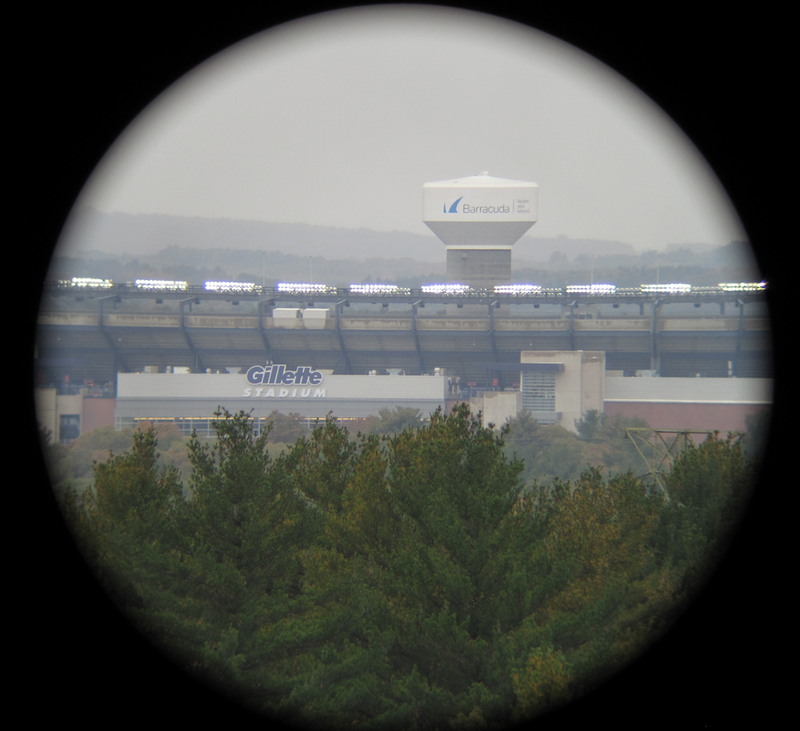 Another prominent feature visible from the Overlook is Gillette Stadium. I arrive on the ridge about an hour before game time, and Gillette is lit up like a spaceship – glowing in the fog and light drizzle (yes, the rain persists!). Rock music drifts over the intervening hills from the public address system. I wander further along the ridge to Allen’s Ledge, where the golden yellow hickories form a dense stand. 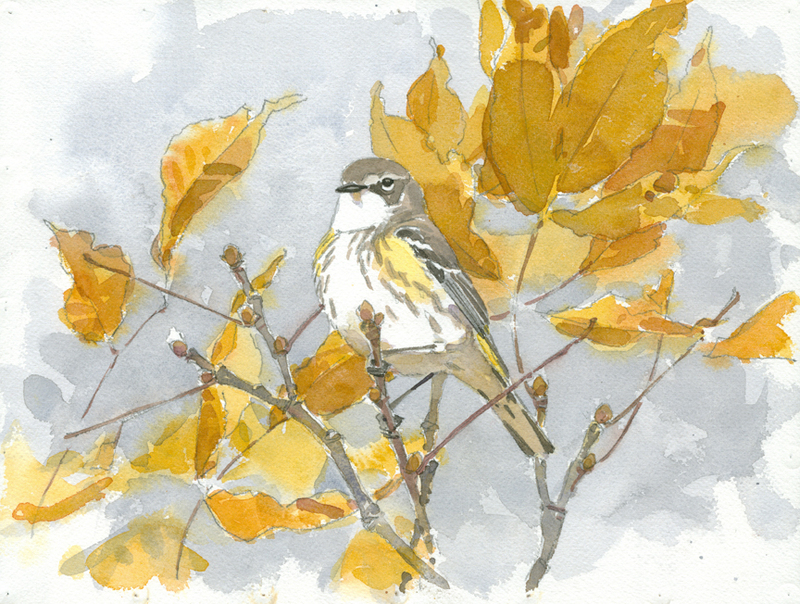 I hear a quiet “check” note, and one lone yellow-rumped warbler flies in to investigate my soft “pishing”. It eyes me warily from the top of a hickory and then flies off. It’s the only yellow-rump I’ve seen today, and I realize that warbler season is winding down for the year. I may not see another member of the warbler tribe until next spring. 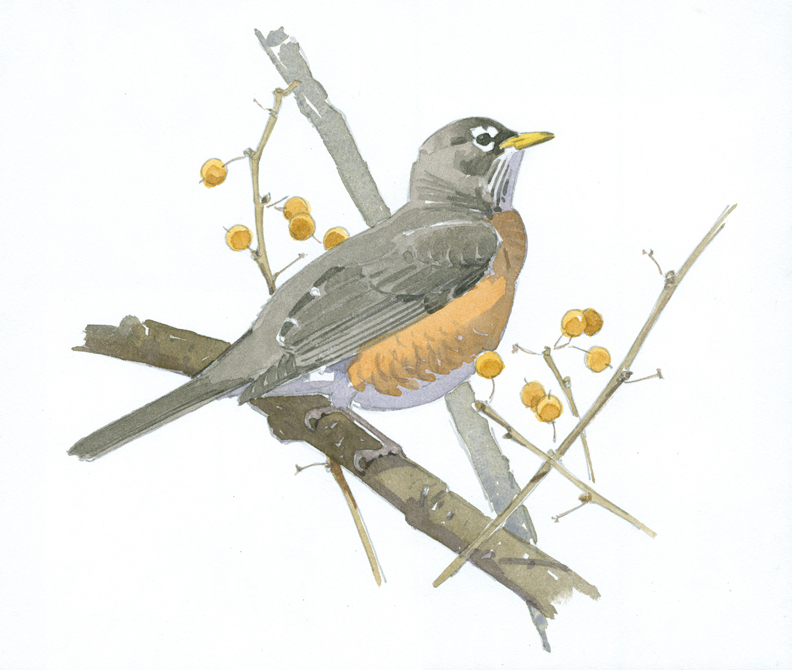 On my way back to the visitor center, I encounter a flock of robins feeding on bittersweet berries near the Billings Barn, so I get to work with my scope. Although many New Englanders think of these birds as harbingers of Spring, they are really year-round birds in Massachusetts. 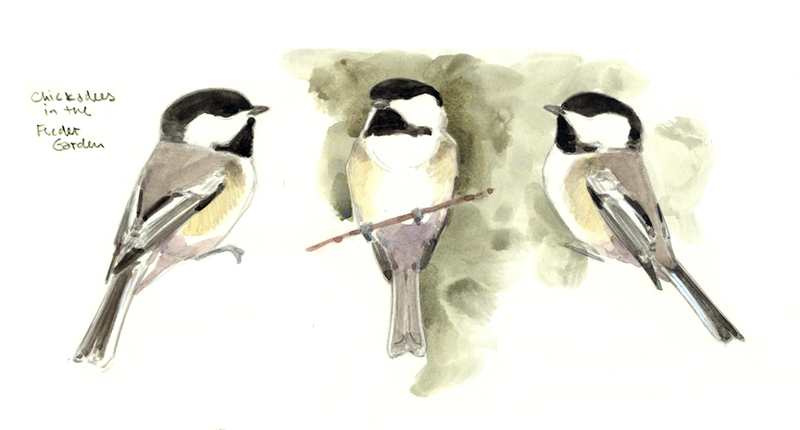 I enjoy observing and recording their habits and behavior through all four seasons. This entry was posted in Artists, Barry Van Dusen Residency, News and tagged Barry Van Dusen, Bear Oak, Billings barn, Billings Loop Trail, Black-capped chickadee, Bluff overlook, garter snake, Landscape, Moose Hill, Moose Hill Wildlife Sanctuary, Museum of American Bird Art, pignut hickory, pumpkins, Sharon, Watercolor, Wildlife Sanctuary, Witch Hazel, yellow-rumped warbler on December 23, 2015 by Barry V..